The Colorado Department of Transportation will be testing a new way of metering traffic during congested periods at the Eisenhower Johnson Memorial Tunnels. This new method of metering traffic is similar to the traffic signals located at on-ramps that regulate the flow of traffic entering the highways and Interstates in the Denver metro area. Traffic signals will be used to create four lanes of eastbound I-70 on the west side approach to the tunnel tunnel allowing CDOT to better control the flow of traffic entering the tunnel. For the past 25 years, CDOT has metered traffic at the Eisenhower Tunnel when traffic volumes exceed of the capacity of the highway or when an accident or inclement weather causes traffic to come to a standstill, backing up into the tunnel. When traffic backs up into the tunnel, CDOT stops all inbound vehicles from entering the tunnel until the back-ups clear. This is done for safety reasons. As there are no shoulders in the tunnels, emergency vehicles must be able to respond to an accident, fire or medical emergency and they can’t get through when traffic is at a standstill. When metering is underway, CDOT stops all traffic from entering the tunnel. Traffic is stopped for 15-20 minutes at a time on average but it can take much longer for the end of the traffic queue to get moving again. Instead of just stopping all traffic, CDOT will be trying a new method of metering traffic. This method is used in other states like California and New Jersey. This method is similar to the ramp metering method used in the Denver metro area and other congested areas. 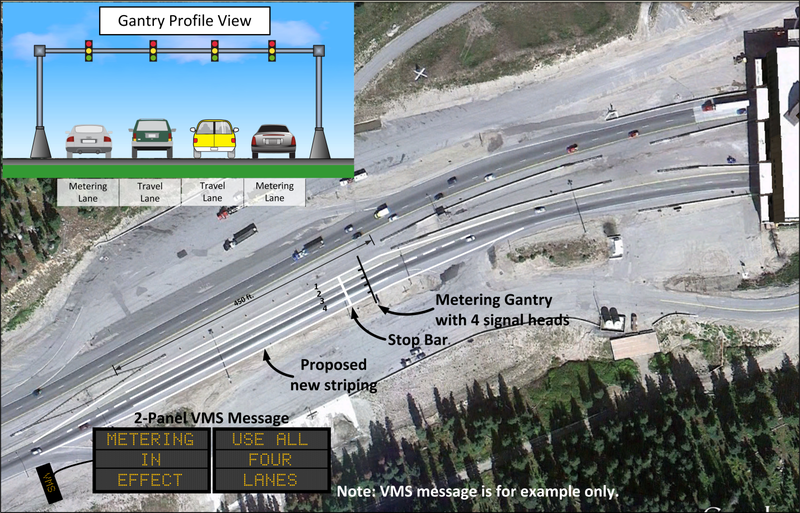 When metering becomes necessary, as traffic approaches the tunnel, it will be spread into four lanes with traffic signals located above each lane. The traffic signals will be used to alternate lanes of traffic in an effort to more efficiently regulate the flow of traffic into the tunnel. The traffic signals will cycle every 4-8 seconds so that vehicles will only have to stop briefly before being allowed to enter into the tunnel. CDOT hopes that this continuous flow metering with only brief stops will reduce the delays caused by traditional metering. For every minute traffic is stopped for metering, it can take as much as eight minutes to get the backed up traffic moving again. Metering is not a preventative measure but rather is reactive to traffic conditions. CDOT will continue metering only as a last resort when there is gridlock in the tunnel. Metering is not being done as a congestion relief measure. While reduced delay may be a benefit of continuous flow metering, it’s not likely to be a significant improvement. Metering will not work if there is a severe accident or something that results in no traffic movement. CDOT does not meter for air quality. The only reason CDOT meters traffic is for safety. When continuous flow metering is in effect, flaggers will direct traffic into the four-lane configuration. The highway will not be widened to four lanes. The four-lane configuration will only be in place if metering is underway.